This episode on a broad spectrum was okay. No strong feelings towards it. It seemed more like a gap filler, giving us some nuggets of info without giving us too much. The biggest amount of character development comes from Ivy/Drizella. In the past she was taught magic by Regina which seemed to a plot by her mother to take her heart for Anastasia. Would that even work? Hearts can only be traded when true love is involved? Whatever, it’s hard to sort out the ever changing rules of magic. At least it seems that True Love’s kiss will break the spell but Drizella, who appears to have cast the “Dark Curse” made it hero proof as some will happen to Henry should he True Love Kiss with Jacinda. If the Charming ever around they would bring up that third option. Also Drizella’s issues are mother based, like so many other characters before her; Regina, Zelena, Rumple ect. Basically she set up the curse because he mother didn’t love her and she wants her to suffer. Also Regina wakes up because Ivy needs her help. Ok sure, Ivy is still the best of the new characters. Tilly/Alice isn’t bad though. Speaking of, is Tilly/Alice Eloise? I mean Rogers is after his missing daughter, Eloise is missing and Tilly/Alice is being set up to be his missing daughter and Rogers is hunting this cold case, that is his plot. So unless this is a misdirect seems likely BUT WHO KNOWS til it’s reveal. I suppose that is a reveal for another episode. Again this was an ok episode. Nice to see Regina back and Ivy is a treat but no real strong feeling toward the episode. Also the second Lady and the Tramp reference and it about another Italian restaurant, other things happen in that movie. How about someone walking a cocker spaniel with a blue collar and with a large standard schnauzer terrier mix with red collar and another person walking a cairn terrier and bloodhound. Better than a line about pizza at Bella Notte with stray dogs, because dogs are the best and this season is lacking them, at least there was sometimes Pongo and Charming’s dog. This Adelaide Kane is a beautiful girl, think I saw her somewhere but can’t remember, she would make a good french-born Esmeralda, she looks quite young and alluring. I haven’t watched the original OUAT, but I read some of your posts, it seems fun in a friendly way, do you think it’s worth to watch this second part without watching the first, besides, I am looking for some shows to watch with my younger sister, she will turn eight next month, do you think OUAT is appropriate, besides, can you recommend another kid friendly show who adults can enjoy as well? 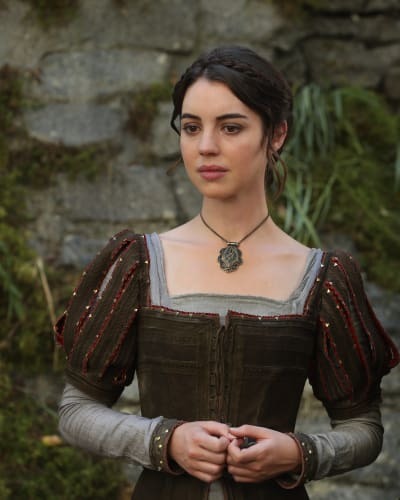 Agreed, I think Adelaide Kane could make a great french-born Esmeralda. I think you need to watch the other seasons of OUAT before you can watch season 7 so you won’t be totally lost of who is who since it does refer back. I don’t think there is anything too inappropriate for children in OUAT, maybe it’s a PG. I would eight is a good age to watch it. Hmm other shows for kids and adults? I personally LOVE Over the Garden Wall, it made for kids but I know some many adult who like it. Avatar the Last Airbender is great.